KitMonsters – Casio PT-1. The music makers’ guide to making music. 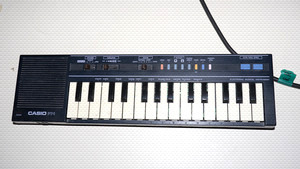 The Casio PT-1 is a rare vintage 1980s mini keyboard with a built-in speaker and rhythms such as bossa nova and samba. It has four instrument voices and you can alter the pitch as well as record 100 notes.